Caltex sponsored CGR team Clich National Title | Welcome to Chevron Lubricant Lanka PLC. April 1, 2008 : The Railway volleyball team sponsored by Chevron Lubricants Lanka PLC has clinched the National Volleyball Trophy for 2008 both in the women’s and men’s categories at the recently concluded tournament. The Railway volleyball men’s team took on the Sri Lanka Ports Authority and the women’s team took on the Sri Lanka Air Force in the finals held at the Sugathadasa Indoor Stadium recently. In the men’s final, Sri Lanka Railways defended their position in a three set straight win against the Ports Authority, while it was clean sailing for the women’s team against the Sri Lanka Air force. 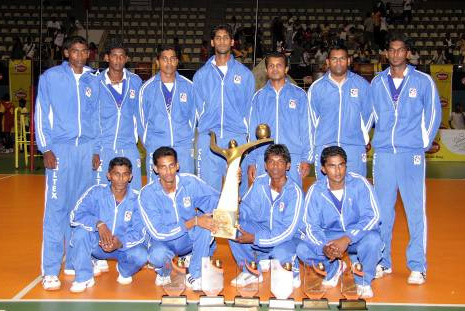 Chevron Sri Lanka came forward in 2008 to support the railway’s volleyball team. Through this sponsorship CGR will work towards leveraging the individual competencies and capabilities of the players for the further develop the team. The organization has also ensured the necessary equipment is made available to the team through this sponsorship.